Up at 6 – ankle still hurting and can’t walk on it properly. Insurance definitely won’t cover anything. It was a long, arduous journey down. The ankle began to improve eventually though I went over it again a couple of times, including once badly just before lunch at Phakding. Still getting used to the Nepalese version of ‘flat’. The last hour before Lukla was gradual climb and I perspired more in this period than at any other time during the trek. In the final twenty minutes, I was being caught up by some of the Newcastle contingent and convinced myself that this was now somehow a race to the finish line. This is something that shouldn’t really be done on a long endurance trek such as this, but I was really dying for ‘it all’ to be over. Reached Tara Lodge and collapsed unceremoniously on a bench in the tea room. That’s enough exercise for a year now, I should think. We tipped the porters and sherpas in the evening after dinner. They are paid 700 Rs a day, 600 of which goes to food expenses, so they make a pittance. Tips make all the difference. The smiles were abundant and each of them went around the room to shake our hands while clutching their right arms above the elbow with the left hand – a sign of the utmost respect and honour. Dawar and Prakash were tipped equally and Nyema the most with a round of applause and hugs galore. We really have been treated like kings. Kelly came to my room later and we had a long chat about the trip. Having seen the expressions of gratitude on the faces of the porters, she seems to feel rather guilty of her own privilege. She kept repeating the tip amount “thirty dollars” in sort of awed disbelief, knowing how much it was worth to her in Britain in comparison to a porter in Nepal. I must say. I’m glad in a way, that she was upset by the realisation. It means she’s taken the situation on board and that, I think, makes all the difference. Awareness, especially in people as young as us is just as, if not more valuable than, the money we raise. Up at half six this morning. Still a bit of ill feeling from certain among Newcastle. We ascended for an hour before it flattened out then descended to a wooden bridge. Five minutes before lunch at Tengboche, I fell badly on my left ankle. Had to have it sprayed with deep heat and bandaged. Had a massage from Nyema at lunch which only slightly helped, unfortunately. 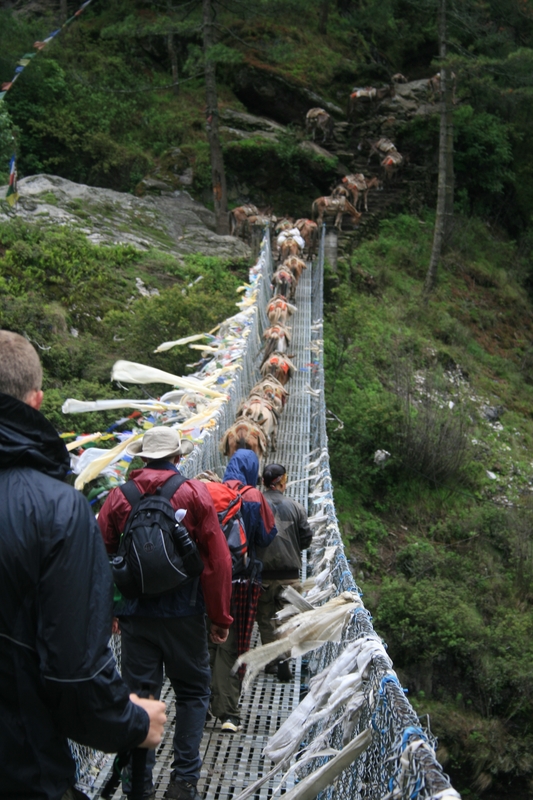 From then til Namche, I was an hour and a half behind the rest of the group. I spoke to Nyema about alternatives, should I need them. The tour company we’re with say that an air lift is not covered by insurance. 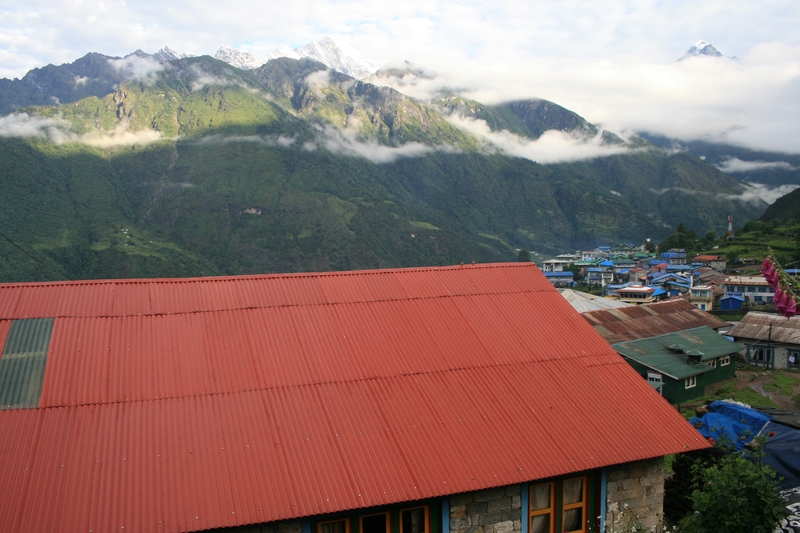 Sophie and I were woken at 4am by the porters next door to us playing bloody music on their phones. Grr. 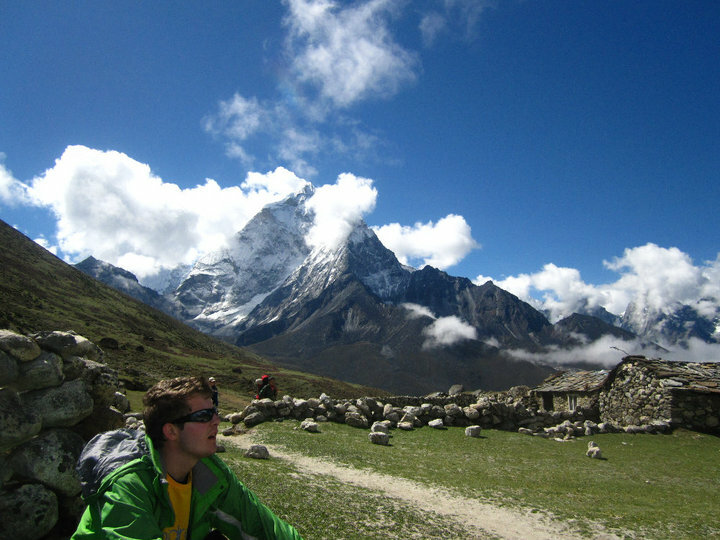 A few people got up at half four to go to Kala Pathar, in the hope of seeing a better view of Everest. 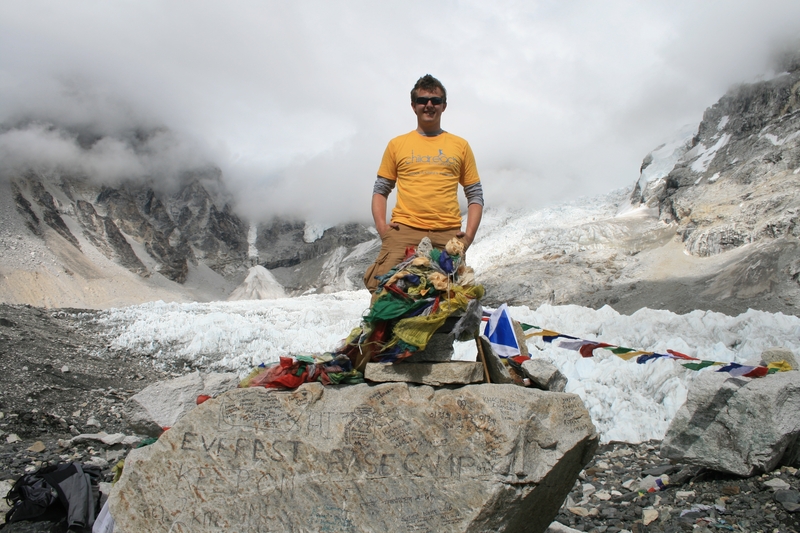 I was so not arsed, since my main ambition for the trek was to reach Base Camp, though a couple of people, Garam especially, had desperately wanted to behold Everest in all it’s glory. You can see the top of it from the door of the lodge – good enough for me! We had breakfast late and set off around half nine. We all very much resented having to stop for lunch two hours later (myself in particular). We all dream of meat: chicken, steak, tomato, Greek salad and Sprite have all been oft-repeated in our verbose fantasies. After lunch (standard fried rice and chips) we headed downwards into the valley. The group thinned out and we kept to ourselves, lost in our own thoughts. The surroundings, once we got into the valley of Pheriche could have been the Outer Hebrides. Pastures green and U-shaped valleys galore. The entire way down all I had in my head was the hymn ‘Jerusalem’. The accommodation at Pheriche was luxurious in comparison to what we’ve had of late. We even got a special treat of veggie burgers for dinner. Bliss! Played charades against Newcastle – we would have won but Kelly, being fidgety, absent-mindedly shuffled the cards we were using to mark the points. Mare! There was a great show-down before bed between Aberdeen and Newcastle regarding ‘Ginger’ the stray dog who’s been with us since Lukla. He whines at night and we decided to kick him out, so we dragged him by the scruff of the neck. He whined, and many of the Newcastle people began to object saying it was ‘harsh’ and ‘cruel’. Yawn. In the end, he was locked out. The toughest thing about this day has been the lack of oxygen in the air. Even when one stands immobile for minutes, one still feels out of breath. It’s very frustrating and uncomfortable, especially since one’s most basic instinct is to assume one is suffocating. We started off at 8 and soon caught up with Bernie and Camilla, who had stayed somewhere else and set off earlier than we had. At this point, the boys and Darya kept ahead with Bernie and Camilla while the girls fell back considerably. Conversation flowed steadily within our group and this, I think, lifted our mood, or at least it certainly gave mine a kick. I discovered that Camilla knows friends of mine in Edinburgh. The world really is minuscule. Gorakshep was reached by lunch time and Camilla went off to find Bernie who had powered ahead. Our lunch was a welcome break but took so long to come that when we set off again, we were sleepy and rather unwilling. The trek was corrugated and thus frustrating. We witnessed several avalanches along the way and the glacier is breath-takingly awesome. 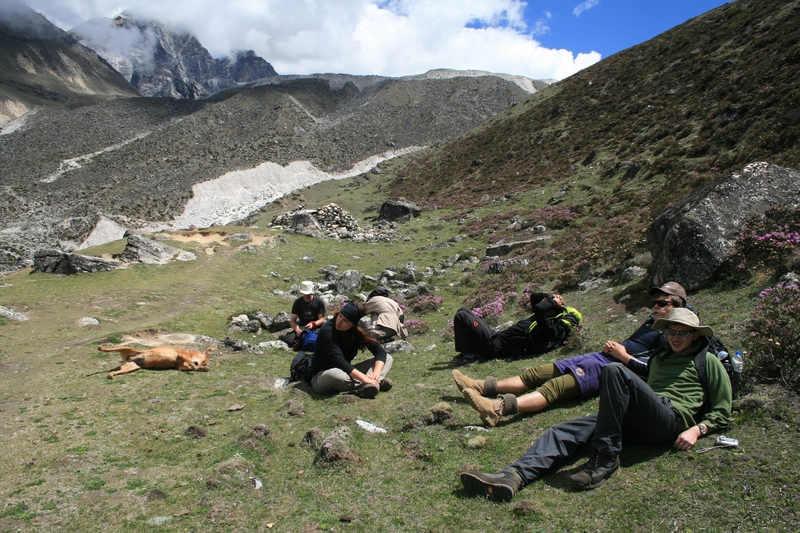 Base Camp was reached around four in the afternoon and the feeling of relief was just immense. Everybody was laughing and hugging each other, taking photos and drinking whisky. I felt very tired but quite content. The journey back was miserable as it began to rain but the evening was spent by the wood-burner drying clothes and drinking hot lemon. Played Cheat and Old Maid and went to bed at 8. One of my better days. 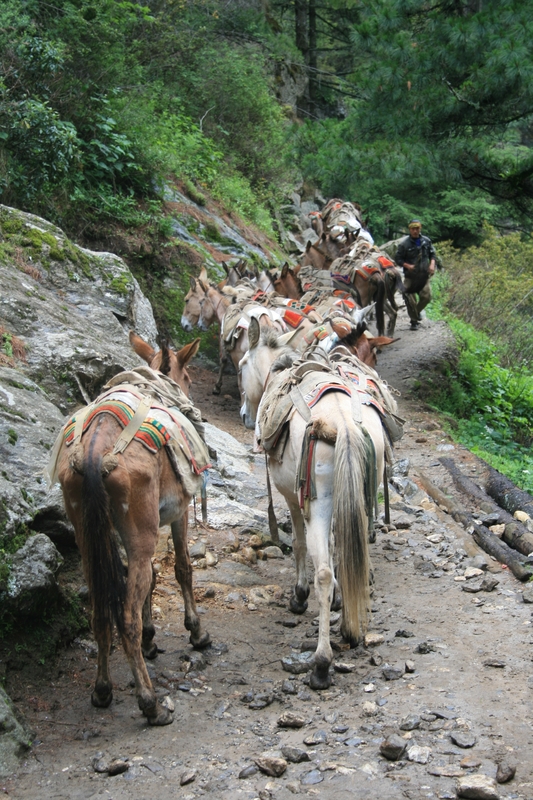 The first part of the day’s trek was fairly easy-going. Once we had climbed a steep incline for about 100m, the terrain became fairly flat with the odd undulation. There were herds of yak dotted haphazardly across the landscape along with odd shepherds’ huts of stone. We crossed a rushing river just before lunch and the sun came out as we sat down. After midday, the climb up a very steep hill dotted with boulders too about two hours which were fairly hellish. Once we’d reached the top of this however, the surroundings were spectacularly eery. This is where many of the memorials to dead mountaineers are situated, and they stand inconstantly speckled across the area for about a mile. There are prayer flags everywhere here. 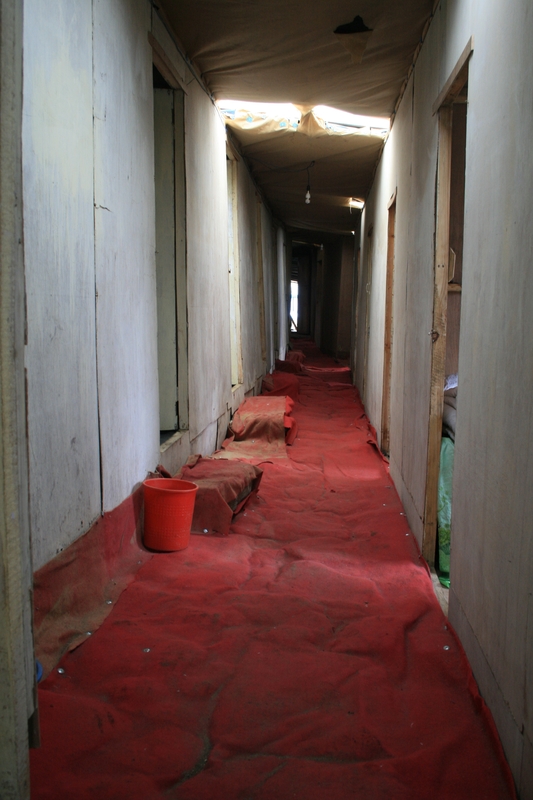 The accommodation at Lobuche is the very poor, the rooms are essentially huts. No windows, just white corrugated plastic on the ceiling – one of the girls has seen mice. My headache, thus far mild, has fairly exploded and is very painful. There was a planned hike in the afternoon after we had arrived a Lobuche but I was kept in bed to rest (no sleeping allowed) Nyema, our head sherpa gave me the world’s greatest head massage with Tiger Balm and felt miles better afterwards. Dinner was the usual carb-fest. I went to bed very early and slept fitfully. Kept waking up in a panic because thinking I was choking, a side-effect of the low oxygen levels at this height. Everyone’s been getting it apparently. At this point, I just can’t wait to go down. I’m writing this from beside a prayer flag 4,600m up the Khumbu Valley. The sun is shining fiercely and there is a stiff, cool breeze at my back. The air is abuzz with bees and there are at least five butterflies with yellow and black wings chasing each other around me. 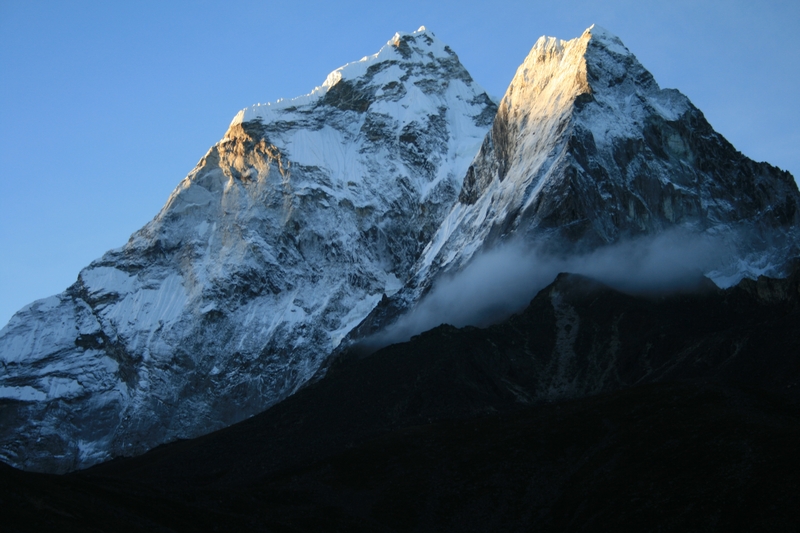 In the distance, I can see Lhotse covered by cloud and to my right across the valley, I see the spectacular north face of Ama Dhablam rising above everything – one of the most beautiful sights I’ve ever beheld. In short – I’m grabbing myself a little piece of Heaven. Stroke of luck – two girls of fun-seeming temperament have walked into our lodge. Bernie is a doctor from Mayo and Camilla is from Edinburgh and she’s a journalist. 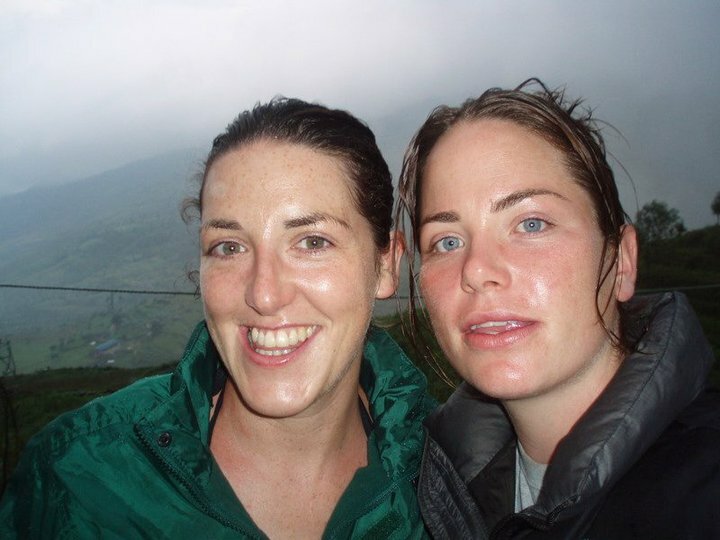 The girls have done the entire trek so far without a map, a compass, a watch or a sherpa. All they have is a bandana that has a trek map imprinted on it. Camilla went to Gordonstoun with cousins of Sarah’s and her father’s from Kilkenny so plenty of chats have been had all afternoon. She’s also a keen player of Spit – must beat her late her. It’s awfully good to have people we don’t know around us, something new always does wonders for a group.